Many years ago, a friend’s cigar puffing dad owned a Jaguar XJ – a leather armchair with a warp drive which seemed appropriate for the Jean Luc Picards of the golf club. He maintained that his dad wasn’t truly rich – being rich meant that wouldn’t matter if you put out cigars on the walnut dash. That seemed to be an argument for vulgarity over fiscal irresponsibility, but now years later, I am the proud owner of such a slab of vintage glory myself. Not being one to appreciate the vertiginous Olympic ski jump launch part of a car’s depreciation curve – I got in on my Jaguar XJR when it was a teenager. As anyone knows teenagers need more sleep and more fuel than babies, but I’m going to ignore the cost of ownership of the car at this age and focus instead on just how much a new car’s value plummets as soon as the salesman at the dealer turns his back on you and breaks into his fake-suntanned smile. That will make me feel better every time I need to replace the timing chain tensioners. How did I come up with the curve? It’s a bit of a fudge based on data from WiseBuyer.co.uk. For one thing, model changes meant that I couldn’t just plug data into a spreadsheet and draw a graph. So I opted to compare the original price of a car of each model type with the retail resale price of that car after a period of years. I had to assume that the vehicle mileage was 10,000 per year, and I didn’t adjust for inflation. Overall the results aren’t that surprising – a luxury car that costs the same as a two bedroom terraced house in Skegness when it’s new becomes very quickly worth half of what it was – in around four to five years. The shallow part of the curve is where the costs of ownership are most likely to rise fast – but around the 10 year mark onwards, it looks like the car won’t depreciate too much if you own it for a year. If you follow the logic that a well kept car will start to appreciate at about 15-20 years as presented in this fun article about buying cars at the bottom of their depreciation curve, it may well be if you buy at around 15 years old and the car can be restored or has been carefully maintained, you may even stand to sell your car for more than you pay for it. Looking at the sample charts from a software tool like Car-Buy-Rater, you can see that cars can be analyzed by both age and mileage separately – I didn’t do a multivariate analysis as I’m too lazy and uninformed. 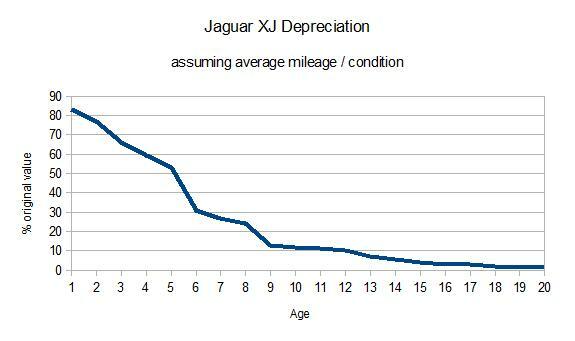 Previous post: Why Buy a Jaguar XJR on eBay with Only 4 Photos?